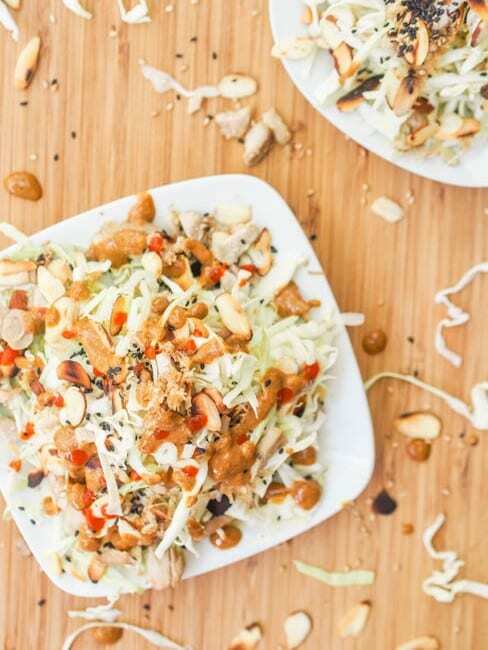 A crunchy, creamy refreshing shredded cabbage chicken salad with toasted almonds and an Asian based creamy tahini dressing makes for a perfect weeknight summer meal. Minimal cooking required. Gluten-Free and Dairy-Free. 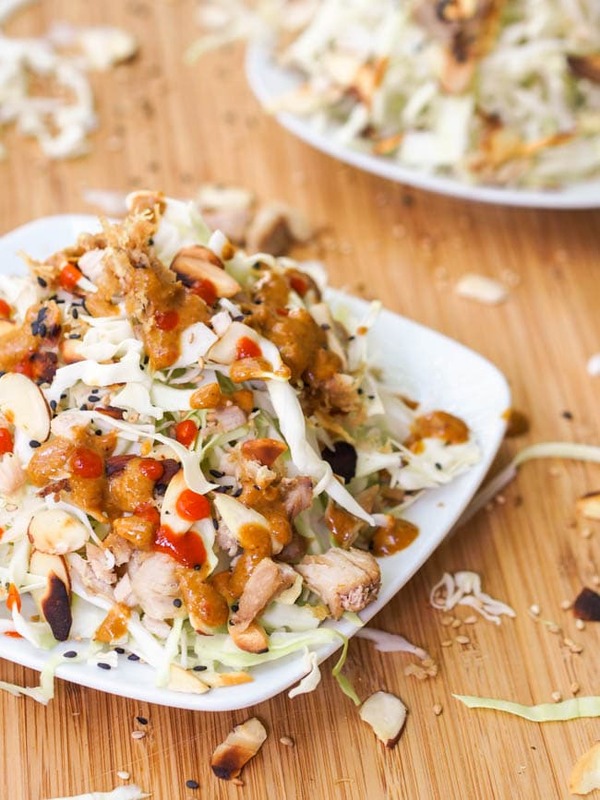 This Asian cabbage chicken salad with creamy tahini dressing is my new favorite summer salad. Nothing too heavy or complicated. 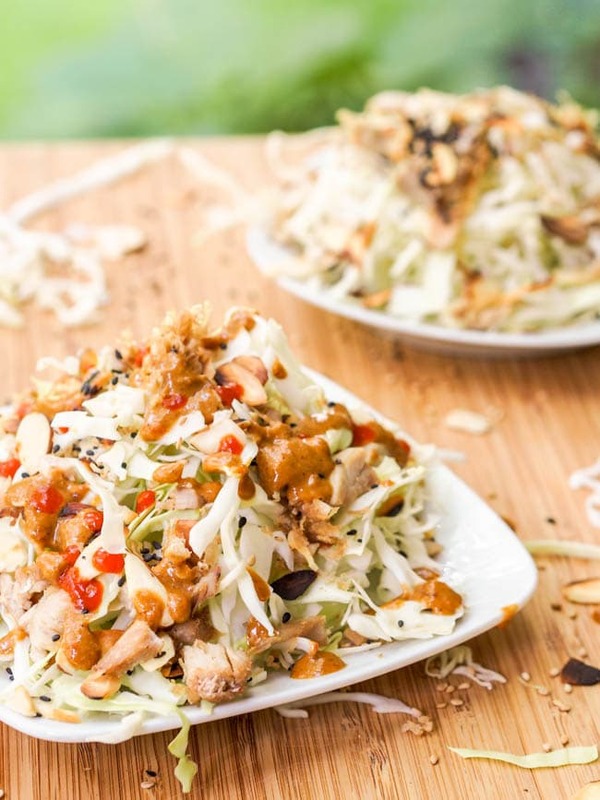 A few key simple ingredients – shredded chicken, cabbage, almonds and a killer dressing that you can whisk up in minutes is all you need. So I had some leftover tahini – which I actually made from scratch because I was craving some Asian noodles and didn’t have the jarred stuff on hand. By the way if you haven’t done so already you need to make your own tahini. The stuff at the store is usually made from un-toasted sesame seeds — and the toasted ones have all the flavor, so we really are missing out. Just toss the toasted seeds – a whole cup of them into the food processor and let that go to work. I added some sesame oil and olive oil to help make the mixture more creamy and flavorful but within minutes I had a whole batch of my very own home made tahini. Since I didn’t use it all up with the initial batch of Vegan Asian sesame noodles I had some waiting for me in the fridge to make this recipe. With a few other classic sauce ingredients which I need in my life pretty much daily – including tamari, rice vinegar, sambal oelek, lime juice, garlic, ginger and sesame oil, the sauce was ready. By the way is anybody else obsessed with sambal oelek like I am? This chili garlic sauce is seriously so good. On just about everything. I add a dollop to pretty much at least one dish a day. And for Asian style sauces — this stuff is golden. I may need to trying making this from scratch some time. So literally within 20 minutes you can have this whole cabbage chicken salad ready. Minimal cooking required. Just to toast the almond and lightly pan fry the chicken to get a bit of crispyness to it. Oh and be sure to watch those almonds as they toast. Every single time, I look away for a minute and come back to half a pan of burnt and I meant blackened almonds. Tsk tsk tsk. Enjoy every bite of this crunchy and refreshing cabbage chicken salad enveloped in a creamy tahini based dressing! Heat pan over medium heat and dry toasted the almonds until browned. Remove from pan. Add olive oil to the pan and lightly brown the chicken. In a small bowl combine the sauce ingredients, tahini, tamari, rice vinegar, chili garlic sauce, lime juice, garlic, ginger and sesame oil. Whisk until smooth. 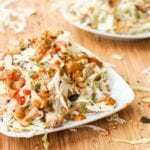 In a large bowl combine cabbage, chicken and almonds. Serve topped with dressing and sprinkled with sesame seeds.